Karasev is a traditional and famous savory in Tamilnadu. It is mostly prepared during festivals and these can also be enjoyed any time. 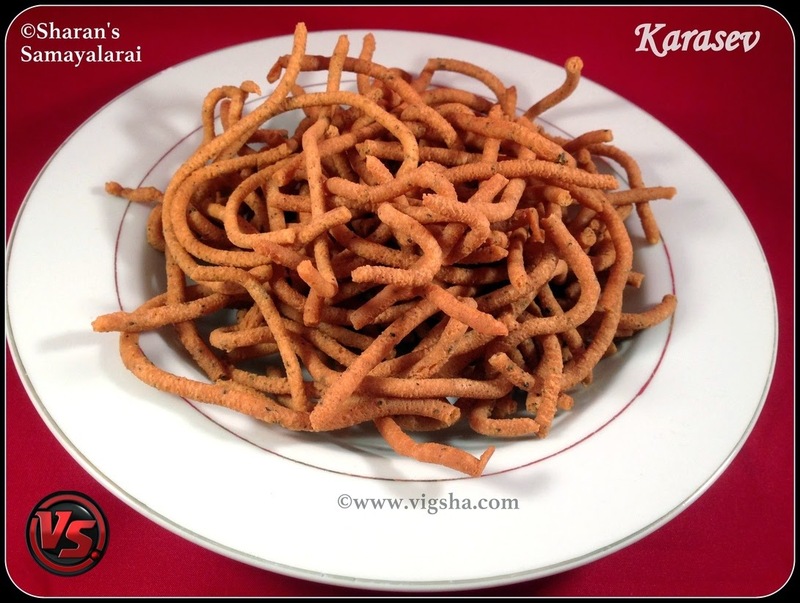 This was my first attempt on making Kara Sev and it turned so well as it is uncomplicated with just few ingredients. There are many way to do this recipe as the flavoring part can be changed as per our taste. here are two main variations, very crispy and crunchy ones. And the other that's soft and almost melts in the mouth. Today I'm posting the quick & instant version which is crunchy and crispy. 1). Sieve both the flour ( besan and rice flour ) together for even mixing. Keep it aside. Pulse the pepper corns in the mixie jar till coarse or pound it in a mortar and pestle. Fix the multi holed nozzle in the murukku mould and grease it. 2). Mix together ghee, cooking soda and pepper powder nicely with hands until little foamy. Then add bengal gram flour, rice flour, hing and salt. Add lukewarm water little at a time and knead it to a soft dough . Dough should not be too hard nor too soft. Just thick enough to press on the ladle. Cover and let it rest for 30 minutes. 3). Heat oil in a pan for deep frying. To check if the oil is hot enough to fry the karasev, drop a small piece of dough into the oil. When it comes up immediately then the oil is in the right consistency. Fill the murukku mould with the prepared dough and squeeze the dough directly directly in the pan, so that long pieces of dough falls into the hot oil. 4). The dough falls through the holes into the hot oil in the shape of small sticks or thick noodles. Do not stir immediately to avoid breaking the sev. Stir after a minute and cook on medium heat till the bubbles in the oil begins to cease. Flip this after few minutes. 5). Turn over and let the other side cook too till its brown in color and the sizzling completely stops. Drain the excess oil on a colander or a kitchen towel and repeat this for the rest of the dough. When cool enough to handle, crumble it gently by hands. Store it in an air tight container. # A tsp of fresh grounded garlic can be added for extra flavor. # To make it more crispy add extra rice flour and to make it softer reduce the rice flour. # The dough consistency is very important. If too much of water is added then the dough will become too soft. Then it will absorb more oil and the sev will not be crisp. If the dough is too hard then the sev will be hard too. # To make long strands of the sev, press the batter slowly but hard on the ladle and not too fast. # Make sure to store the Kara Sev in air-tight container to retain the crispiness or it will become softer. # Make sure to cover the rest of the dough while frying the Karasev, to prevent it from drying out. In-case, if it gets dry for the last few batches, just sprinkle little water, mix once to make it moist.